When BloodHorse.com carries a headline stating "Downward Spiral Continues" and reports that a fairly prominent auction was down over 66% in daily revenue, you know that the Thoroughbred bloodstock market is in an enormous funk. I've been people-watching at the ongoing Keeneland January sale during its first few days. Sentiments are all over the board when it comes to the economy: some think we'll see improvements by the time Fall sales roll around, others expect the downturn to last multiple years. Many sellers believe that it's best to let their stock sell regardless of price, while others are forced to be content with an RNA -- and still others are pulling their horses out of the sale in record numbers. Everyone I've met at the sale agrees on at least one thing, though: one of the toughest segments of any breeding stock sale is barren mares, and this year it probably wasn't worth putting most of them through the ring. Bidders just aren't interested. I understand the reasoning -- if you're paying out a purchase price for a new mare, it's nice to think that she'll have a foal by her side soon that will be marketable, to recoup some or all of the mare's cost. It's an additional "guarantee" that the mare is breeding-sound. And perhaps the best reason of all, in many cases you're able to snag a deal that equates to a terrific discount on the stud fee (already paid by the current owner) of the carried foal. You won't have another mouth to feed -- or board/handling/training expenses -- that comes along with new foals. Just upkeep for the mare. The deals on stud fees in 2009 are likely to be the best ones you've ever seen. We're looking at a significant drop-off in the number of Thoroughbred foals bred this coming breeding season, and almost any stud farm out there will be willing to deal with you to ensure that you don't bring your mare elsewhere. Think slashed fees, special incentives, and creative contracts that, for example, allow you to pay after the foal sells as a yearling. 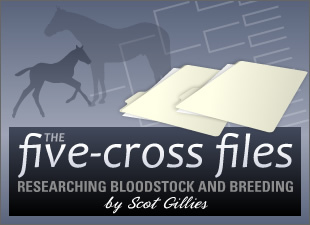 With many breeders taking off a year in 2009, the 2010 foal crop should drop. Maybe even a lot. (My guess is we dip below 30,000 registered foals of 2010, the first sub-30,000 season since 1976). So, the foal you breed in 2009 will belong to the smallest foal crop in recent history. I said a while ago that this could lead to decreased competition and increased opportunity at the race track and promising commercial prospects. I'm even more convinced of it after hearing breeders' cut-back plans. Your barren mare should have a stronger foal in 2010. Researchers disagree on this one, but many prominent breeders over the years have treated the idea as gospel truth: foals bred following a barren year for their dam tend to be stronger and sounder than foals born to mares that have had a long string of foals. Physiologically, it makes sense: a mare that's had a year off to recuperate and restore will be stronger herself, and will pass on extra nutrients to her carried foal. The purchase prices are unbeatable. Many well-bred mares are going through the auction ring without even attracting an opening bid; others are selling for 1/3 of their value from a year ago. Some sellers are in a panic about the market and are making rash decisions to "dump" their horses -- others are actually forced economically to bail out at "fire sale" prices. By the way... yes, I've added a barren mare to my small herd this year. Yes, I'll be breeding her in 2009. In fact, I'm breeding to race, banking on the idea that a good runner in the foal crop of 2010 will have increased opportunity. The whole Thoroughbred industry is based on risk-taking. The troubled economy we see today presents new risks -- but it also affords new prospects if you're willing to seek them out.